Global Volunteers team members often have the opportunity to participate in a traditional Sweat Lodge ceremony. It’s a unique experience for most non-Indians, who may have only heard about this practice in cultural lore. Many volunteers try a few “rounds” inside the lodge around hot rocks that are doused with water while prayers and chants are expressed. Our Blackfeet friends respect volunteers’ inexperience with this tradition, and enable them to leave the Sweat after any round to rest in the cool air outside. Much can be learned by accepting the invitation to participate in the ritual with members of the Blackfeet Nation. Below are some volunteers’ reflections of their first time at an authentic Sweat. After a productive day of service, Lauren and Jayce headed off to the Sweat Lodge offered by a local family. 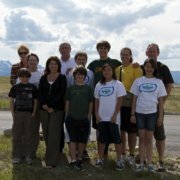 It was sure to be a unique and educational cultural experience with our new Blackfeet friends. It started with everyone gathering in a small dome no more than four feet high and 20 feet around. More than a dozen people crowded – shoulder to shoulder – inside. Most of us sat cross-legged with our hands in our laps. The local participants were in the process of concluding their Sun Dance, so this meant this would be a longer sweat than usual. An example of a sweat lodge of the Blackfeet Nation. At the beginning, everyone passed around a ceremonial pipe and said a prayer. Then the first “round” began by loading hot stones – which were heated in a fire outside – into the pit inside the sweat. Water is then sprinkled on the hot rocks. The number of stones (and intensity of heat) increased with each round. The door closed, leaving us in complete darkness as the steam began to fill the lodge. Every round consisted of four stages before the door was opened. We were told that at any time, if we needed to leave, we could go out of the sweat. But, no one left. Tonight, there was a total of eight rounds, some were warmer than others, and the last was the hottest. Prayers were offered during each round, and some people offered very personal stories about their need for prayer. We were encouraged to ask for prayers for anything we needed healed in our lives. The leader chanted in Blackfeet, and most local people sang along. The exhaustion was immense and the experience was nothing like I have ever gone through. Julia says she was transformed by the Sweat Lodge Ceremony. “I almost see myself as who I was before the Sweat and who I am after. I felt such a profound sense of connection to not only the locals, but to all of humanity. It was powerful, really powerful,” she told us. We were swept up in this ceremony for over three hours, sometimes becoming part of the rhythms of the chants, and sometimes breathing very slowly to keep our lungs from overheating. There’s no way to explain it, but it’s certain we were deeply affected on a spiritual level by the ritual of it all. It was incredibly gratifying to go through this unique cultural tradition, and I’m thankful they allowed us to join them. I never expected to be accepted so quickly as a non-Indian by people I had just met. The biggest takeaway from it all was a better understanding of their strong connection to their native religious beliefs. I myself, not being very religious, was exposed to something genuinely new. I will surely tell stories of this Blackfeet cultural experience and others with Global Volunteers for many years to come. Volunteer in the USA – Montana on the Blackfeet Reservation. Call or chat with our program specialists for more information!